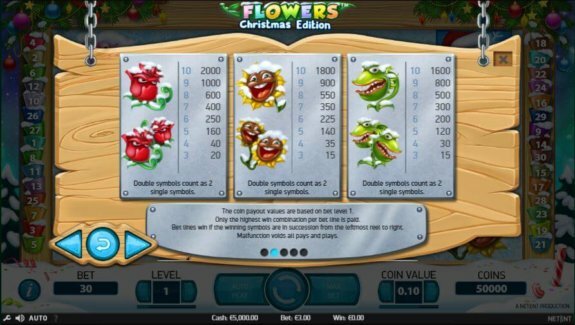 Net Entertainment took their existing video slot Flowers and added a dash of Christmas spirit to combine them into Flowers: Christmas Edition. You don’t have to wait for December to enjoy your favourite holiday season. You will get to experience the intricate gameplay of this frosty video slot by playing on a 5×3 grid. Why Flowers: Christmas Edition? 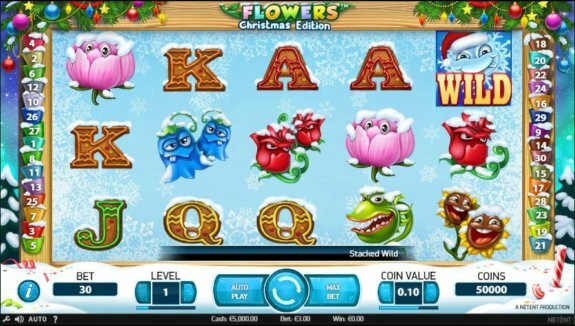 This slot is a perfect choice for everyone looking to feel the joy of Christmas. With its simple gameplay, it is an ideal choice for the newcomers. Where to play Flowers: Christmas Edition? 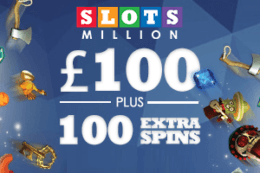 Christmas is the time of sharing and that is exactly what this video slot intends to do – share its riches with you! Brought to us by NetEnt, this video slot is played on five reels. It has 30 paylines which mean up to 30 ways of getting paid. And with an RTP of 96.3%, you most definitely will! Everyone likes Christmas, and that only means that this Christmas-themed video slot will be equally popular. Our experts who reviewed this video slot confirmed it is playable for free. However, you can always try playing for real cash. Who knows, perhaps you are lucky enough to earn some awesome rewards! Christmas is an annual event commemorating the birth of Jesus Christ. This religious and cultural celebration holds place primarily on December 25. It is celebrated across the world and has its traditional cuisine, music and carols depending on which area of the world you come from. The best-known figure of Christmas today is Saint Nicholas, also known as Santa Claus. A jolly old man with a long white beard travelling on his reindeers. He ascends through the chimneys to give presents to the children that behaved through the year. Don’t forget to leave him some milk and cookies, and a carrot for his reindeer Rudolph! The gameplay of Flowers: Christmas Edition is pretty straightforward. All you have to do before spinning the reels is adjust how many coins you are betting per line and your coin value. Both options can be found on either side of the spin button. By clicking on the info button in the bottom left corner of the interface, you will access the options. In there, you can check out every winning payline or learn more about the symbols and their worth. 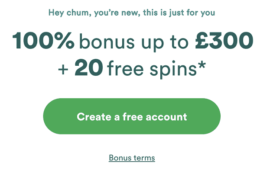 Autoplay feature is customisable so you can determine the number of spins or when you would like the feature to stop itself automatically. 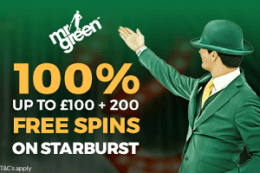 By clicking on the Max Bet button, you will place a maximum bet on your next spin. Play Flowers: Christmas Edition for free! Even though they are set on a Christmas-themed background, we cannot really say the symbols themselves fit the theme. Most of them kept an appearance of the symbols in the original version of this video slot. There is a total of 11 symbols in this video slot. Nine of them are basic, and two are special symbols. Basic symbols are split into two categories – ones represented as letters and ones as the flowers. All symbols vary in value but, aside from that, the flower symbols can appear as double while the letter ones cannot. Double symbols count as two single ones. The Free Spin symbol is represented by a grinning cloud. As with the flowers, the Free Spin symbol can also appear as a double. The Wild Symbol is shown as a snowflake wearing Santa’s red hat. It substitutes all symbols except the Free Spin ones and doubles. During Free spins, stacked Wild symbols can appear on the reels for a chance at a bigger reward. 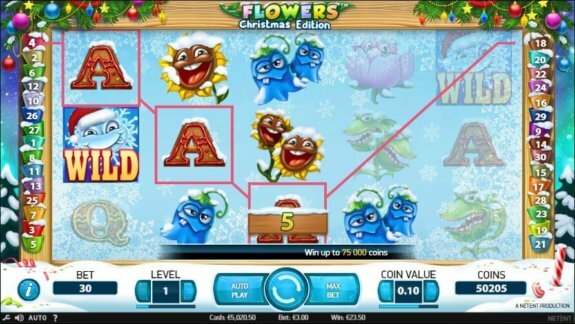 Flowers: Christmas Edition has a Free Spins feature. To trigger it, you need to land four or more of Free Spin symbols. 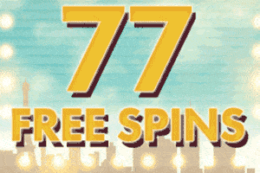 Landing four or more during the Free Spins feature itself will re-trigger it, and you can do so multiple times. All wins during this are multiplied by three. When three or more of them appear on the reels, the amount you bet is multiplied by the bet multiplier. 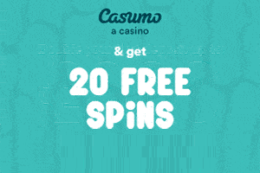 By triggering this feature, you can win between 10 and 30 spins depending on the symbols and also an x2, x3 or an x10 multiplier. 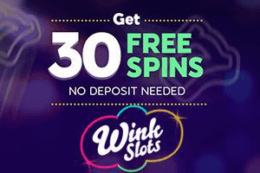 Widely popular, this video slot is playable for free. If you would like to play it for free, you don’t have to look any further. You can start playing right away on our website. We hope you enjoy it! If you would like to raise the stakes, however, you can always try playing for real money instead. 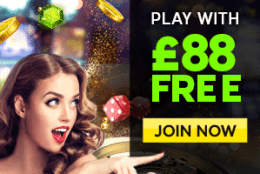 Some of the best-licenced casinos that have this joyful video slot in their catalogue are 888Casino, Mr Play Casino, Rizk Casino, Thrill and Video Slots.